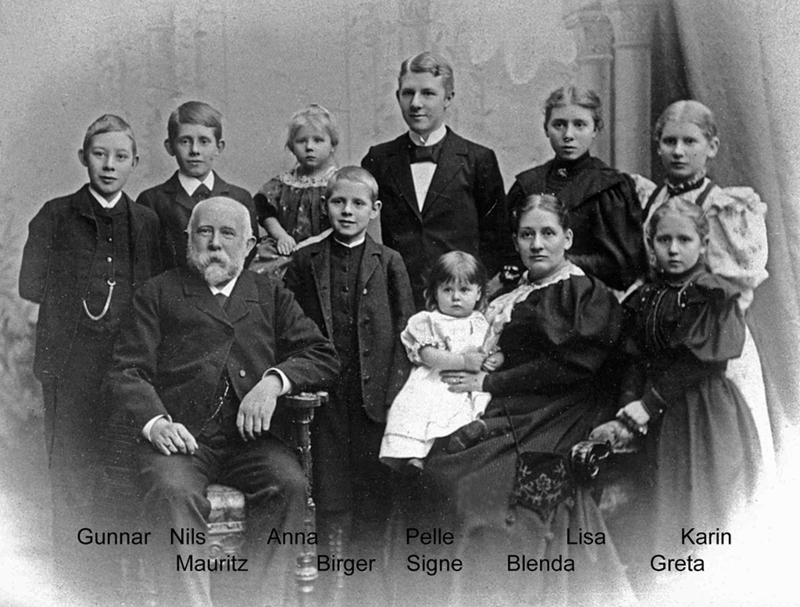 Gunnar Mauritz Widforss was born in Stockholm, Sweden to Blenda and Mauritz Widforss, the sixth of thirteen children. 1872 - Yellowstone National Park created by President Grant. 1879 - Thomas Alva Edison filed his first patent application for "Improvement In Electric Lights"
1880 – The first steam-powered tram service begins in Stockholm. 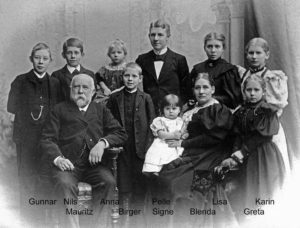 1880 - Stockholm Bell Telephone Company opened Sweden's first telephone exchange in Stockholm. 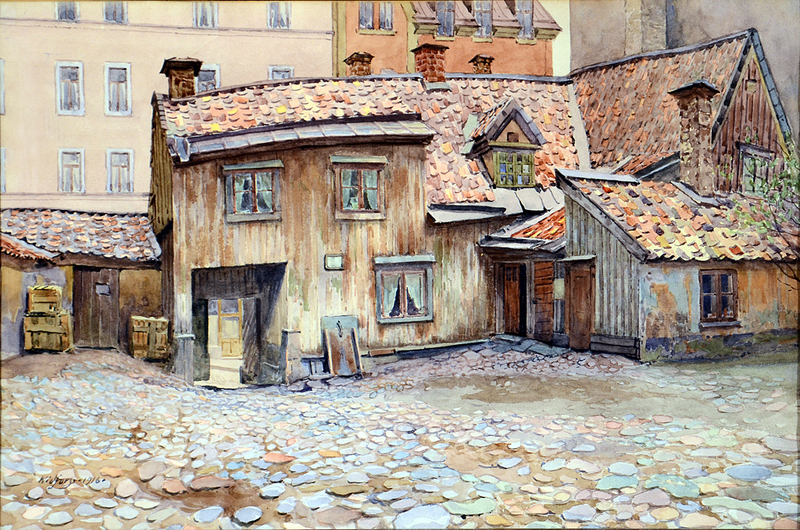 Studied to be a muralist at the The Technical School (now Konstfack) in Stockholm, the same school that his mother, Blenda Widforss, studied at. Initially protected as a California state park in 1864, Yosemite National Park was established in 1890. Mt. Rainier National Park created in 1899. 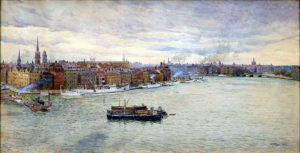 Gunnar Widforss painting very early in his career, no date. Albert Einstein’s paper “On the Electrodynamics of Moving Bodies” on special relativity is published. 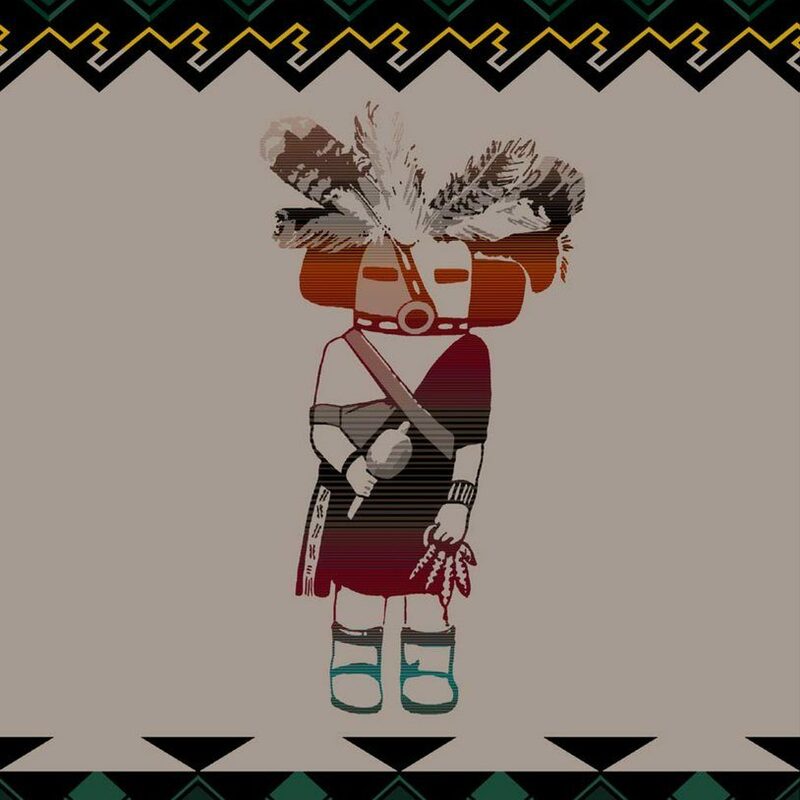 Architect Mary Jane Colter designed the Hopi House at Grand Canyon for the Fred Harvey Company. Upton Sinclair’s The Jungle is first published. 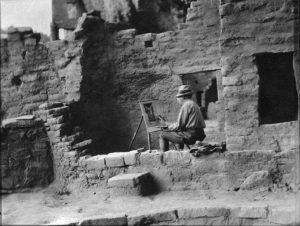 President Theodore Roosevelt established Mesa Verde National Park to "preserve the works of man," the first national park of its kind. Lived in Brooklyn and worked occasionally as a painter and paperhanger. Architect Mary Jane Colter designed Hermit’s Rest at Grand Canyon for the Fred Harvey Company. Anhulter Hütte mit Hornbachkette, 1912, Reproduction, illustration in the "Journal of the German and Austrian Alpine Club," 1912 Zeitschrift des Deutscher und Österreichischer Alpenverein, Band XLIII, Jahrgang 1912, page 158. 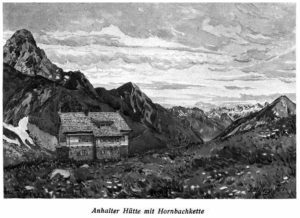 The Hornbach Range is in the Allgäu Alps in the Tyrol, Austria . 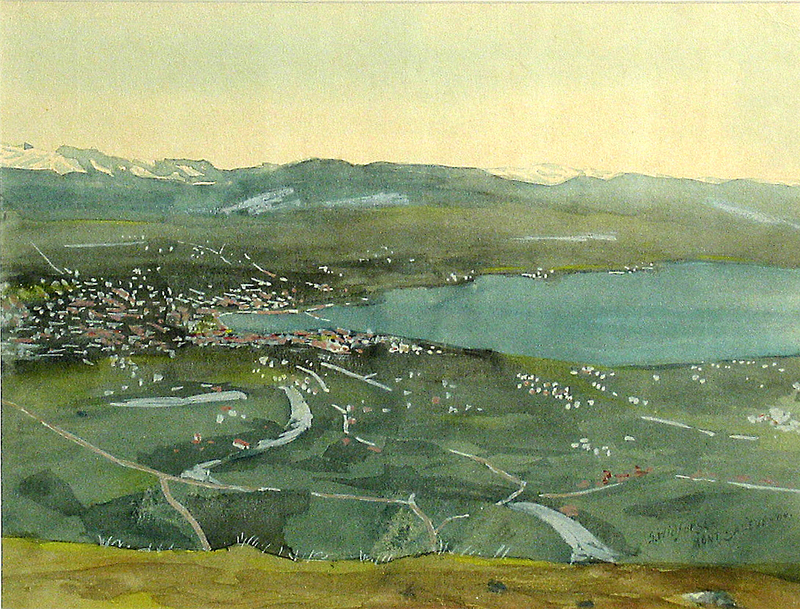 Widforss referred to his painting being published in the journal in a letter to his mother dated September 11, 1912 from Lugano Switzerland. Zeitschrift des Deutscher und Österreichischer Alpenverein, Band XLIII, Jahrgang 1912, page 158. Hornbach Range in the Allgäu Alps in the Tyrol, Austria . Henry Ford created the assembly line method of automobile manufacturing. 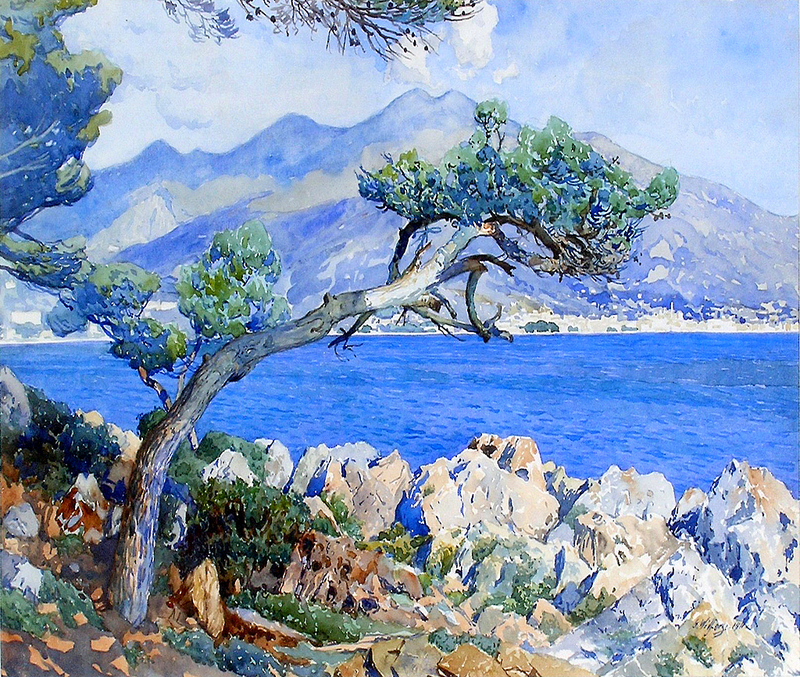 Also 15 from Capri, Beach with Faraglionii. 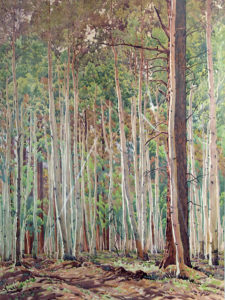 Sold about half of the works. 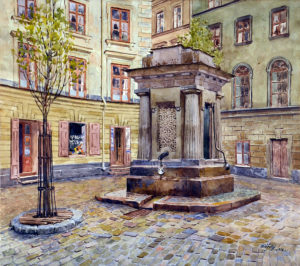 In Paris where he studied at the Academie Colarossi in Paris. 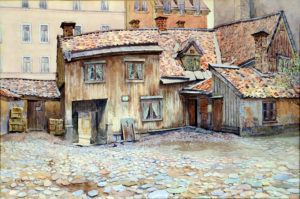 In the late nineteenth century there had been a very large and active community of Swedish artists and art students in Paris. 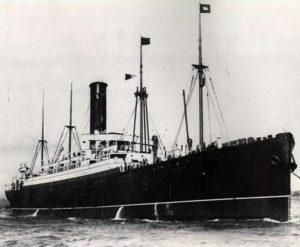 Widforss’ mother visited for a time. June 28 Archduke Ferdinand assassinated and World War I began. 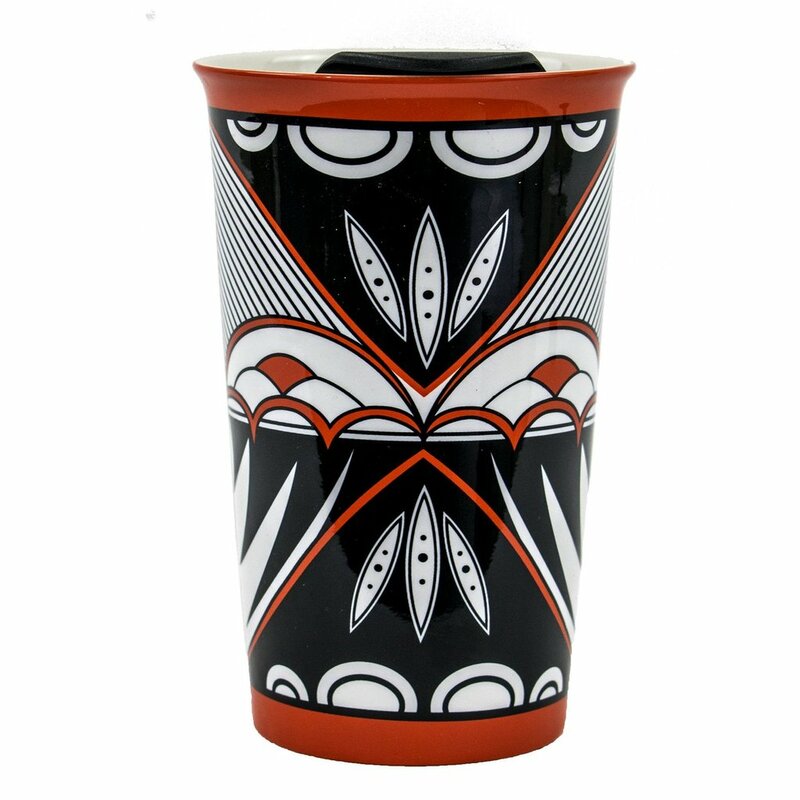 Architect Mary Jane Colter designed the Lookout Studio at Grand Canyon for the Fred Harvey Company. First self-service grocery store opened in U.S.
By 1916 the Interior Department was responsible for 14 national parks and 21 national monuments but had no organization to manage them. In 1916, the United States National Park Service was created and Stephen Mather appointed the first director. At this time, there were 9 national parks in Sweden. The United States entered World War I. In England, Ernest Rutherford first “splits” atoms. 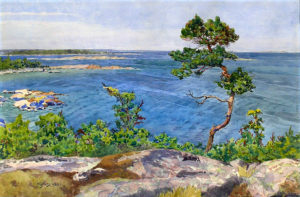 Gunnar Widforss painting on Utö, 1917. 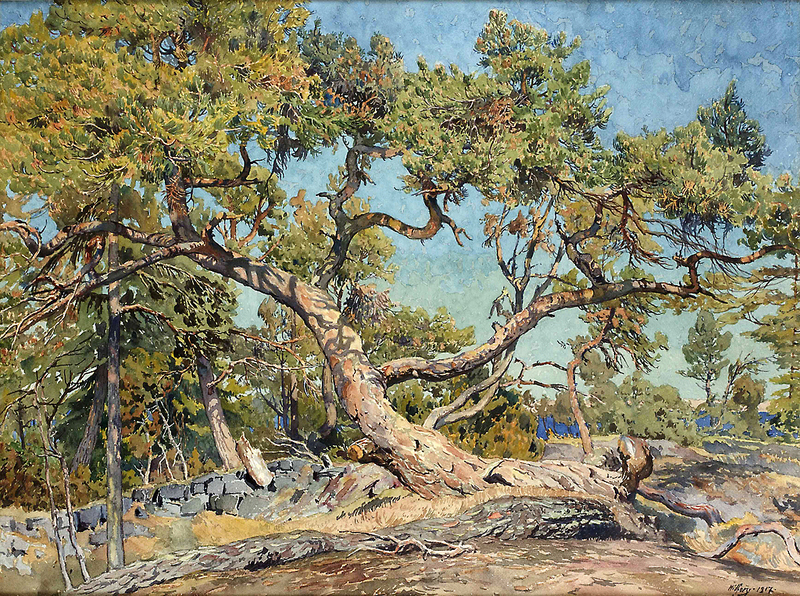 Subject of The Rock Wall, Utö behind him. Exhibition at Hultberg’s Konsthandelat in Stockholm, sold 37 works including Tyska Brunnen. Utö, large island in the Stockholm archipelago. Between 1918 and 1920 the Spanish Flu pandemic killed between 50 to 100 million people. 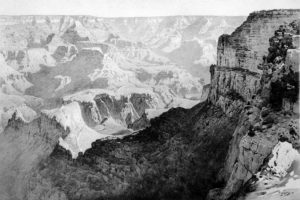 Although United States Senate bills to establish Grand Canyon as a national park were introduced, but defeated, in 1910 and 1911, in 1919 the Grand Canyon National Park Act was finally signed by President Woodrow Wilson. In the United States, the 19th Amendment to the Constitution granted women the right to vote. The League of Nations was established in Paris and the United States Senate voted against joining it. As a result of massive crop failures, one of the worst famines in modern times gripped Russia. Tests and advancements were made that will be the basis for television technology. Albert Einstein received the Nobel Prize for Physics in Stockholm. The first commercial radio station in the United States, WWJ, began operations in Detroit, Michigan. The first radios began to appear for sale in shops. 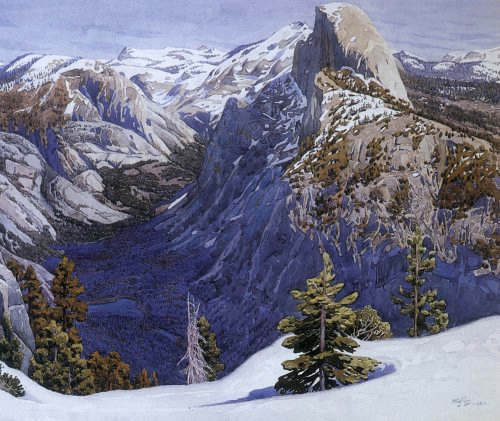 Widforss pays the Sentinel Hotel in Yosemite 5 paintings a month to stay. Sells paintings for $50 each. 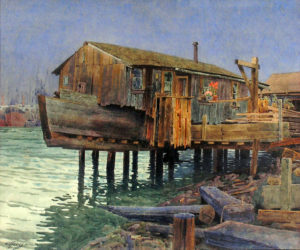 He writes of his plans to make enough money to continue his planned journey to Japan, and then to return to California. Architect Mary Jane Colter designed the buildings for Phantom Ranch operated by the Fred Harvey Company at the bottom of the Grand Canyon. Painted for two weeks around Tuolomne Meadows. Two-week mountain trip with Ansel Hall and E.A. Solinsky, to Mt. 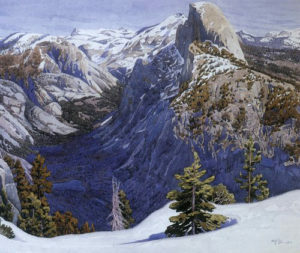 Lyell, Minarets, and Devil’s Post Pile, on a reconnaissance trip pertaining to extending Yosemite National Park to the east. Widforss painted eight illustrations for Songs of Yosemite 8 color plates, originally published by Harold Symes in 1911 and re-published by Ansel Hall. Adolf Hitler was jailed after the failed Beer Hall Putsch (coup), or Munich Putsch. The world’s first domestic refrigerator is sold in Sweden. The world’s first portable radio is developed in the United States. Widforss purchases a 1920 Willys Overland Roadster. First reference to Stephen Mather in a letter to his mother. 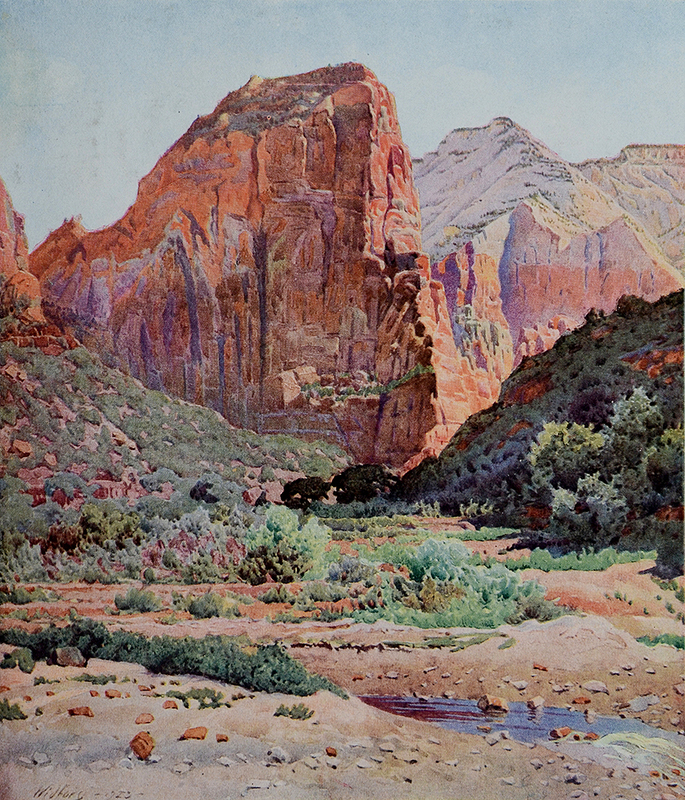 Mather commissioned Widforss to do some paintings of Zion National Park. One of these was used in an article that Mather wrote for “The World’s Work,” published in May 1924. Widforss’ first visit to Grand Canyon. 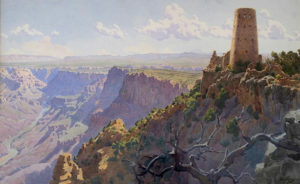 Grand Canyon, North Rim, Widforss stayed at the Wylie Way camp, where he traded a painting in exchange for room and board. He would stay at the camp often in the future. George Gershwin, Ira Gershwin, and Irvine Berlin continue to dominate the music industry and Rhapsody in Blue is performed for the first time. The first regular airmail services started in the United States. I like it better here every week…It nearly always is windy, very windy, which makes it kind of hard to work. 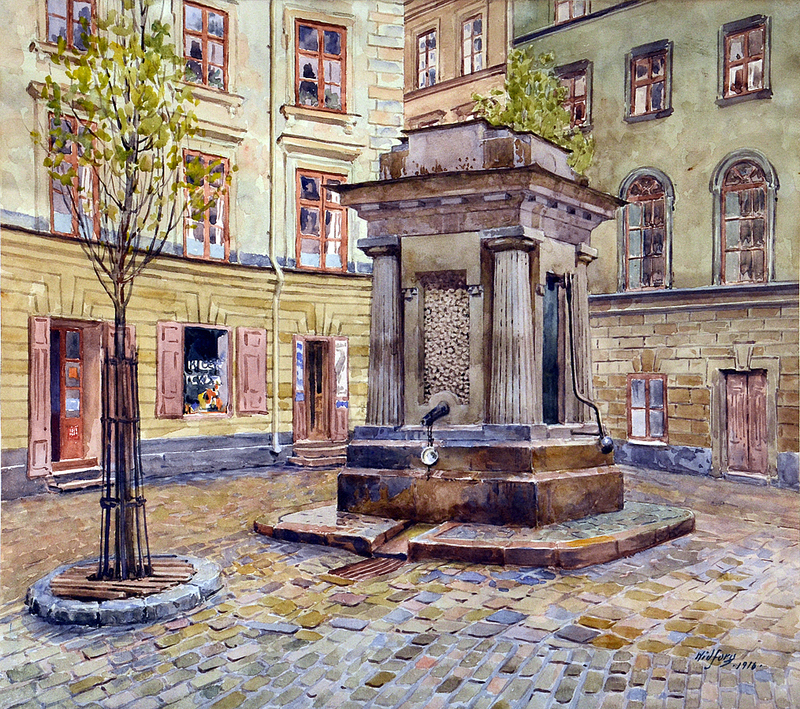 Notwithstanding, I have done a whole lot and hope to do many more pictures before end of May. Have sold 2 and hope to get a commission of Fred Harvey to paint airplane view of Canyon. Will never come back to the Canyon before 1st of April – at least. Too much winter earlier. It is a very slow place here. No kind of entertainment, no change in the daily routine. My Dear Sir: Early in the summer Mr. Stephen T. Mather, Director of the National Parks Service, asked me to come over and see some paintings of the Grand Canyon country, by Mr. G. Widforss. I found them to be very good indeed, quite equal to Moran's work in truth and skill. 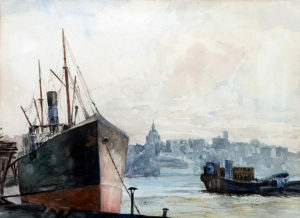 Mr. Mather wondered whether I could arrange an exhibit for the works and I now write to recommend approval of the idea. Letter from William Henry Holmes, Director of the National Gallery of Art to Mr. Charles D, Walcott, Secretary, Smithsonian Institution, Washington D.C.
A couple of paintings from the North Rim will be more valuable for that purpose (DC exhibit) than a few more from Yellowstone. Saw Mather in Yellowstone. 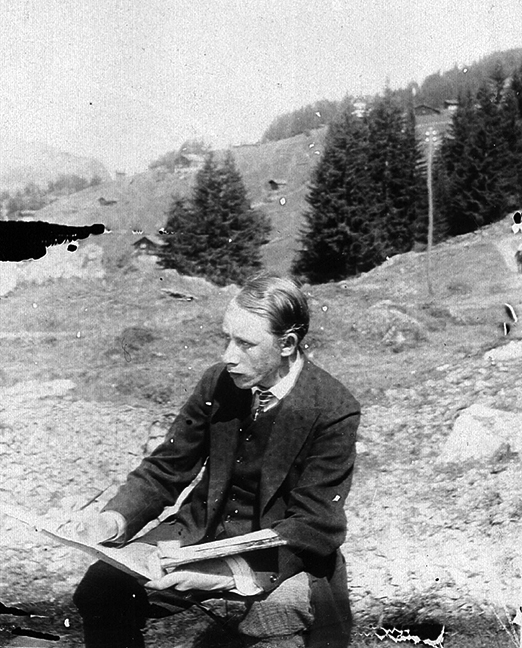 Gunnar Widforss letter to William Henry Holmes. Grand Canyon. Stays at El Tovar. Yellowstone National Park, met with Stephen Mather. 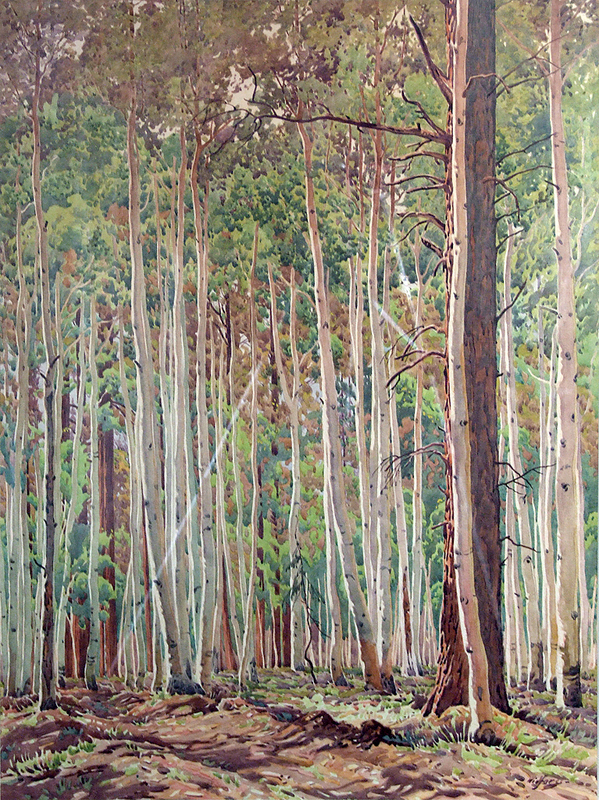 First mention of exhibit that Stephen Mather was trying to arrange for W in Washington D.C.
WIdforss mentions going to the North Rim, Grand Canyon, and that he had done 10 paintings in Yellowstone so far. The Great Gatsby by F. Scott Fitzgerald is published. 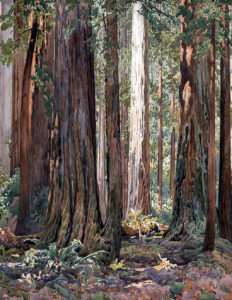 Louis Sands and family from Glendale Arizona visited with Widforss as recorded in their scrapbook, 'Louis M. Sands purchased Gunnar Widforss' watercolor painting of the Redwoods from him where he was working at Schilling's Inn between Scotia and Garberville California on July 17, 1925. The painting Cost $100.00." 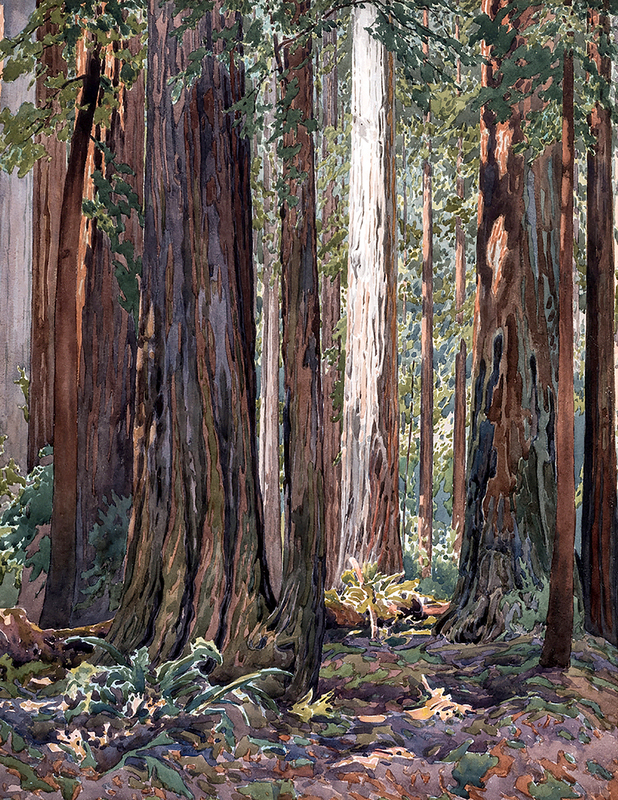 Gunnar Widforss, the well-known painter, is making studies of the Redwoods in the Dyerville-Bull Creek region – has been staying at the Schnelling Hotel, McKee's, near Dyerville. Phantom Ranch, 1925, Watercolor on paper, 24 x 21 inches (61 x 53.3 cm). Painted on commission for The Atchison, Topeka & Santa Fe Railway. Gunnar Widforss painting at Mesa Verde National Park, 1925, photograph from the artists’ scrapbook. 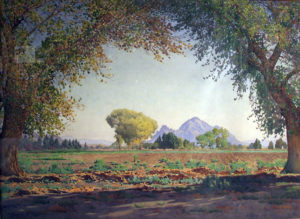 Following his exhibition at the National Gallery of Art, Widforss donates his painting Patriarchs of Zion to the Smithsonian Museum. Travel with Ansel Hall from Mesa Verde to California as part of the National Park Superintendent’s Auto Caravan Tour. John Logie Baird conducted the first public demonstration of a television. Henry Ford announced the 40-hour week. Radio network National Broadcasting Co. (NBC) was launched. Met the Prince, was in his company for two days. Mr. Mather had given him one of my Grand Canyon pictures, while they were there. Good for me I think. When Mr. Mather asked the price of the picture (at G.C. he had said he was going to deal with me directly) I only asked $100 for a $250 picture. That seemed fine, and Mr. Mather said he was going to tell the prince that I had joined in the gift. 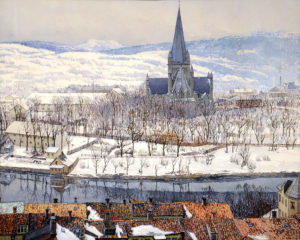 Exhibition “Paintings and Sculpture by Scandinavian American Artists.” Brooklyn Museum of Art, New York, NY. January 30, 1926 – March 2,1926. 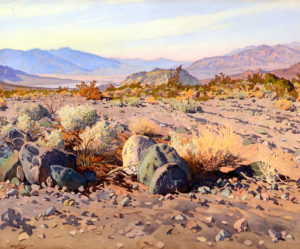 Exhibition with Ferdinand Burgdorf, Canyon and Desert Paintings, at Stendahl Gallery, Los Angeles. 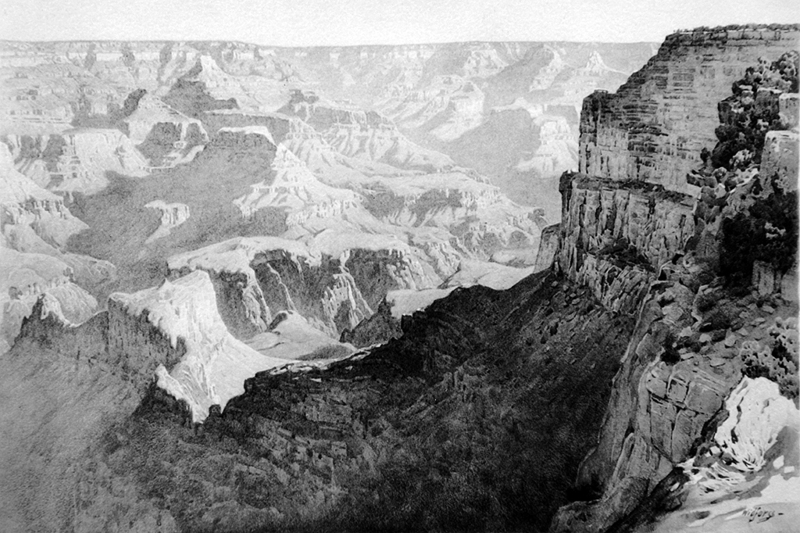 Grand Canyon where Widforss met Crown Prince Gustavus during his visit there. Served as the interpreter for Crown Prince Gustavus during his visit to Yosemite National Park. The Jazz Singer, the first talking movie was released. 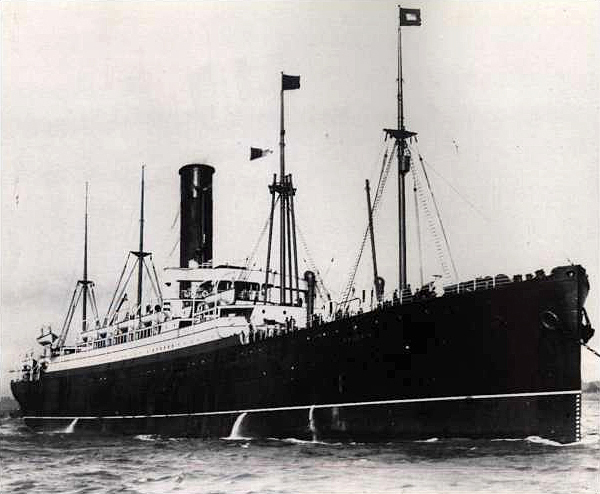 First transatlantic telephone call - New York City to London. Pan American Airways was formed. 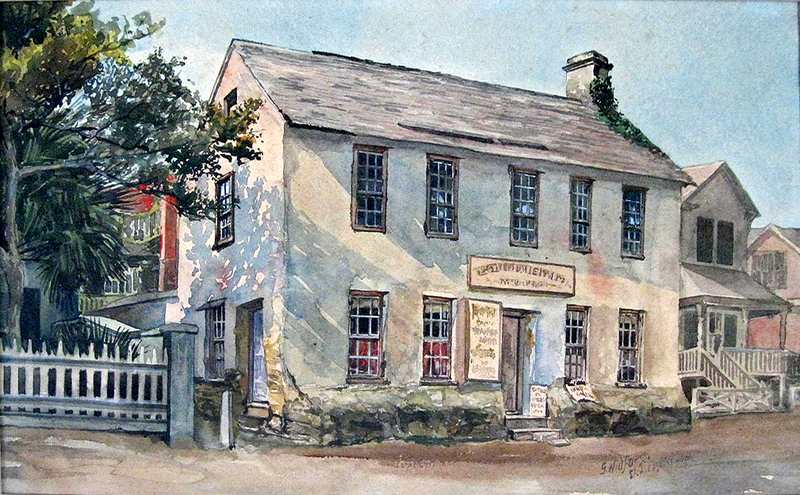 Mr. Tressidor (they call him Doctor now, which is as it ought to be) had me for lunch and I got a commission to paint several interiors and, at least, one exterior of the new hotel. Very kind of Dr. T. to let me wait until the fall coloring is over. And so, I will have to stay here all November too. The Great Lounge in the Ahwahnee Hotel, 1927, photograph from the artist's scrapbook. Mickey Mouse first appeared in Steamboat Willie, a short animated film produced by Walt Disney. Amelia Earhart became the first woman to successfully pilot an aircraft across the Atlantic Ocean. Bryce Canyon National Park created. I’m currently in Oakland and painting harbor views, old houses and boats. 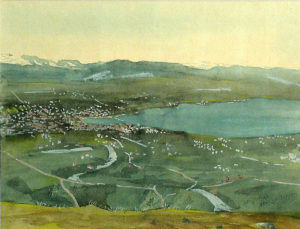 Charles Lindberg left on a 3,500-mile flight from Detroit to Cape Horn South Africa. The Wall Street Crash of 1929, is the stock-market crash that occurred in late October and sparked The Great Depression in the United States, and resulted in world-wide economic crisis that lasted until the mid 1930s. 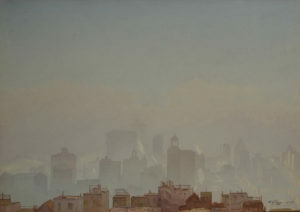 The Museum of Modern Art opened in New York City. Motorola produced the first car radio. The first public telephone booths appeared in London. The German airship Graf Zeppelin completed a flight around the world. 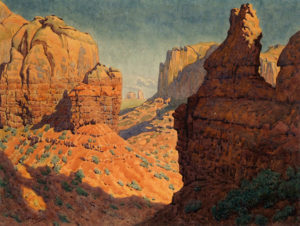 Monument Valley, 1929, Watercolor, 14 1/4 x 19 inches (36.2 x 48.3 cm). 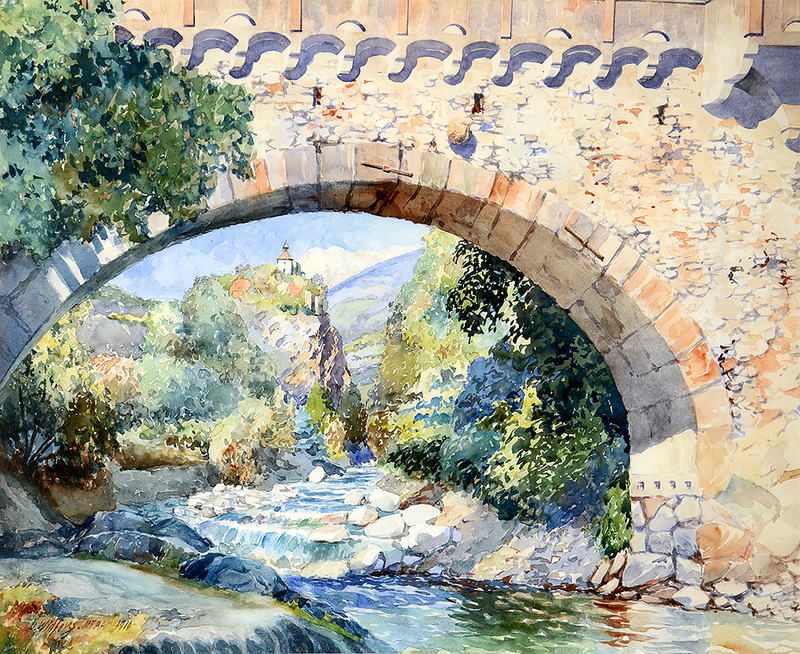 1929 California Watercolor Society Annual Exhibition, Oakland Art Gallery. 1930 was the first year of the great depression. Television was starting to gain momentum but the high unemployment of 8.9% caused problems in every area of life. In Germany, Adolf Hitler's National Socialists became the second largest political party. Mohandas Gandhi informed the British viceroy of India that civil disobedience would begin in demonstration against British rule. Stalin began collectivizing agriculture in the U.S.S.R.
For the first time in the world, a television drama is broadcast. The BBC broadcast the drama The Man with the Flower in His Mouth by Luigi Pirandello. 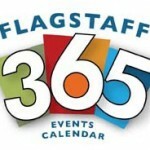 Astronomer Clyde Tombaugh discovered the planet Pluto at Lowell Observatory in Flagstaff. A number of car manufacturers went out of business as people did not have money to buy new cars. The Empire State building was completed. NBC and RCA transmit experimental television broadcasts from antennae at the top of the skyscraper. Al Capone was imprisoned for income tax evasion. Auguste Piccard ascended to the stratosphere in a helium balloon. Ford ended production of the Ford Model A and developed new V8 models. 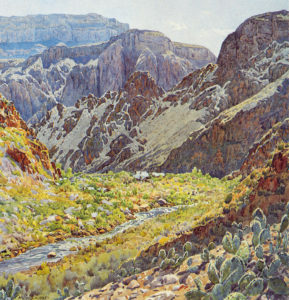 Work began on Boulder Dam on the Colorado River in Nevada and Arizona. Franklin Delano Roosevelt elected to be the president for his first term. Architect Mary Jane Colter designed and oversaw construction of the Desert View Watchtower, which opened in 1933 at Grand Canyon. Working on a painting for advertising the Watchtower, which is under construction, letter to Mike Harrison. Grand Canyon seems to have become my home. If I can live many years yet, and if I can ever again be okay, perhaps one day I may become famous as a painter of the Grand Canyon, and perhaps earn real money. It should go like that. Letter to Blenda Widforss. 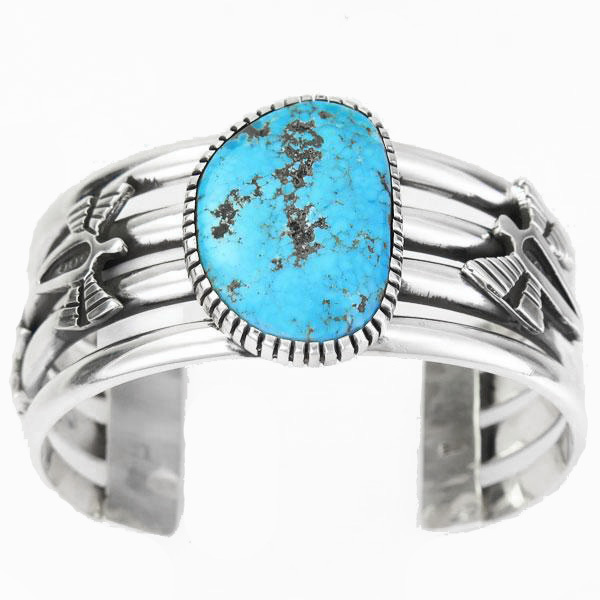 Widforss’ right hand is injured when he is kicked by a mule on the Kaibab Trail while on his way to Phantom Ranch. 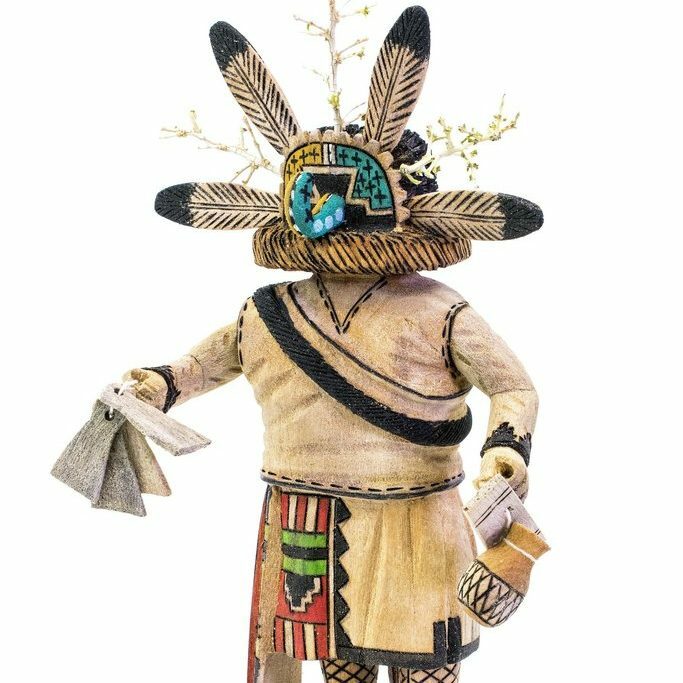 Wins first prize in the annual Arizona Artists’ and Craftsmen Exhibition at the Museum of Northern Arizona, Flagstaff. For the second year in a row, he won first and second place awards from visitor votes. Trip to Monument Valley with Ansel Hall. His friends have birthday party for Gunnar, and they played poker. The worst year of the depression, unemployment peaked at 25.2%. Dust storms in the Midwest began to drive thousands of farming families to California looking for a new start. Franklin Delano Roosevelt launched the New Deal. The Civilian Conservation Corps was established. Prohibition ended in the United States. Aviator Wiley Post flew around the world in 8 1/2 days. Sells three Grand Canyon paintings to Mr. Westinghouse. Turning point in the Great Depression in the United States. Unemployment decreased to 22%. In Germany Adolf Hitler declared himself the fuhrer. In China Mao Tse-Tung begins spreading the communist doctrine and the Long March. In Scotland, the Loch Ness Monster was first sighted. In the United States approximately 35 million acres of farmland were destroyed by adverse weather conditions and millions of acres were in danger. Oklahoma experienced a ravaging drought with temperatures reaching 117 degrees in that summer. Parker Brothers sells the board game game "Monopoly." 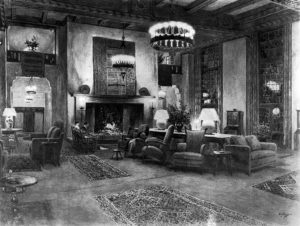 Architect Mary Jane Colter worked on designs for the Bright Angel Lodge at Grand Canyon for the Fred Harvey Company. The new lodge opened in June 1935. These parts have been honored by the visit of several artists and during the closing days of the month Zion almost resembled an art colony. 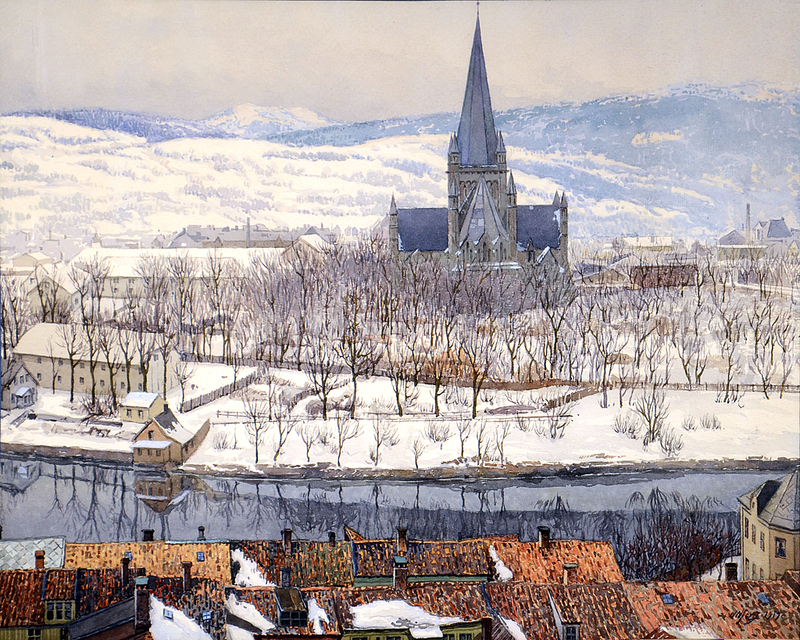 Mr. V. Roth arrived on the 16th and is still with us, working with oils. 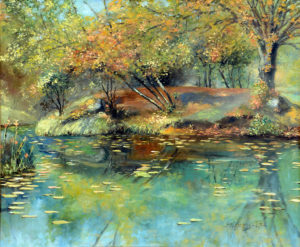 He turns out a canvas at an amazing speed, and considering the rate of production, of good quality. 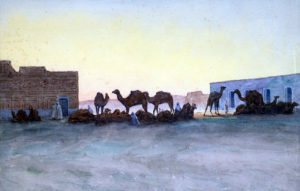 A group of California artists arrived on the 22nd, consisting of A.W. Best of Oakland, H.C. Best of Yosemite, and a Mr. Teague of Oakland. 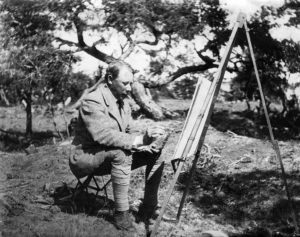 Mr. Gunnar Widforss, noted Grand Canyon painter, arrived on the 28th for a stay of about 2 weeks. 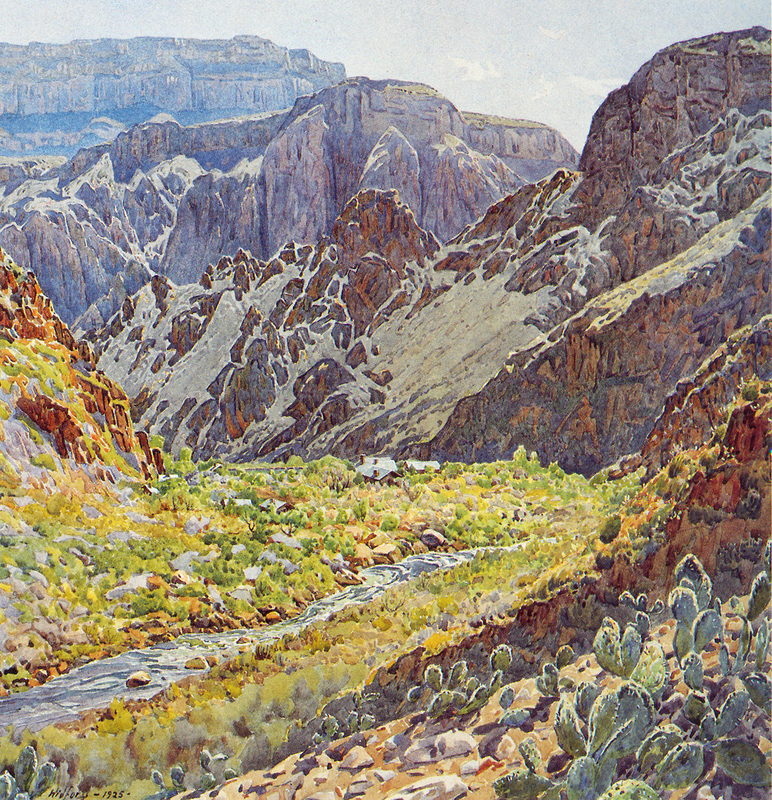 Back in Arizona, Widforss begins work on 8 watercolors for the Arizona PWAP, including the Salt River Valley and Grand Canyon.